This will provide you with a pop-up screen that gives you a range of options for setting the price of your data. 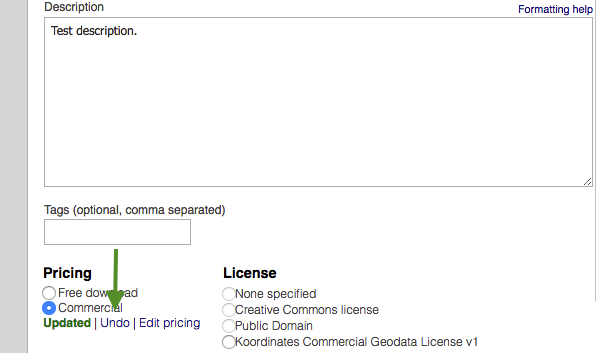 Publishers have three options for how to set the price for their data. 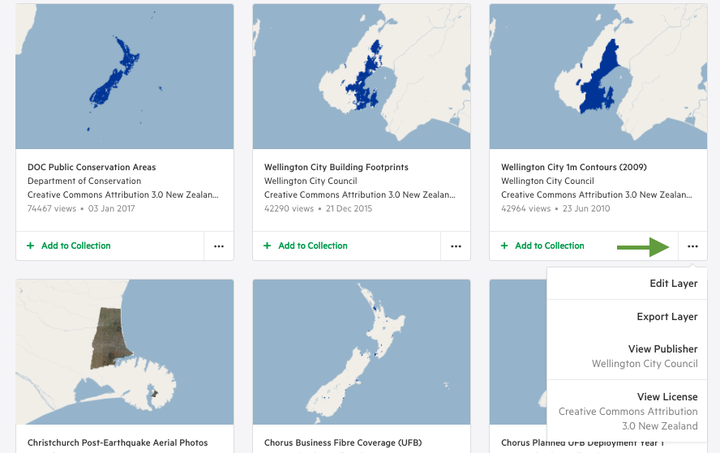 Note that users are able to 'crop' the data they want to their chosen extent. The number of features they purchase will be determined by the features that intersect their crop. 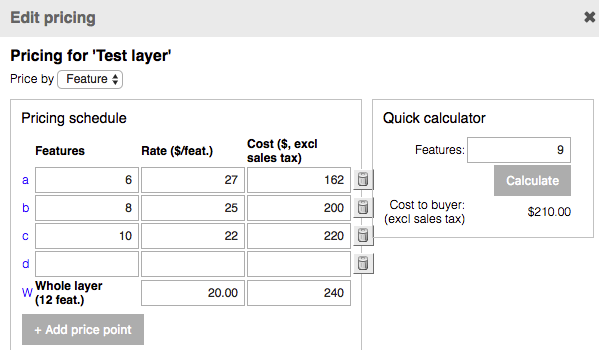 If you'd like to set a single price for the layer as a whole, select 'Set price by layer.' This is the price which the user will pay regardless of crop size. 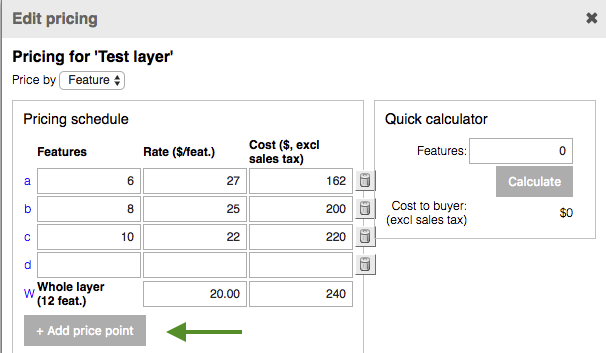 If you wish to set more granular pricing by area or number of features, click 'Add price point' to create a pricing curve. A pricing curve is a pricing model in which users pay a reduced rate per feature / area as the size of their export increases. After you have added the number of features / area for each of your price points, Koordinates will automatically calculate the price for any number of features / area. 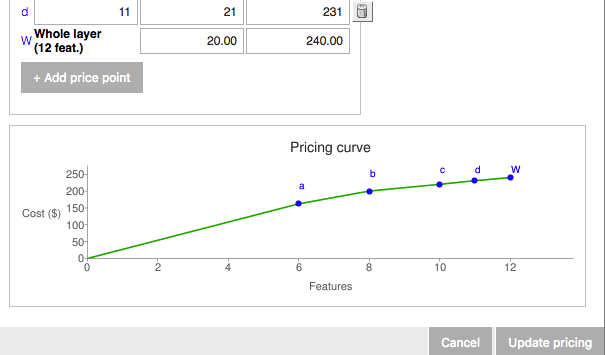 At the bottom of the pricing tool, you will see a visual representation of your pricing curve, displaying what users will pay per number of features or area of their export. Once you have established your pricing tool, you can use the calculator to test your pricing model in greater detail. Simply add the number of features or area of a hypothetical download to be given the price a user would pay (excluding sales tax). Once you are happy with your pricing model, simply click 'Update Pricing,' and the prices will be available for your customers. After you have updated your pricing, you will be returned to the 'Edit' page, where you will have the option to undo any changes you have made. 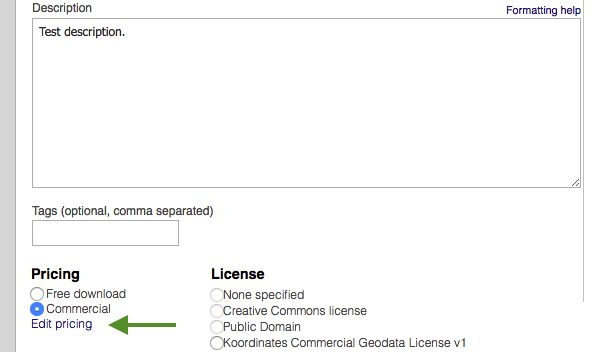 For layers with fewer than 10,000 features, this estimate will be exact. For layers with more than 10,000 features, the estimate will be close, but will not be a precise statement of the cost of the export.